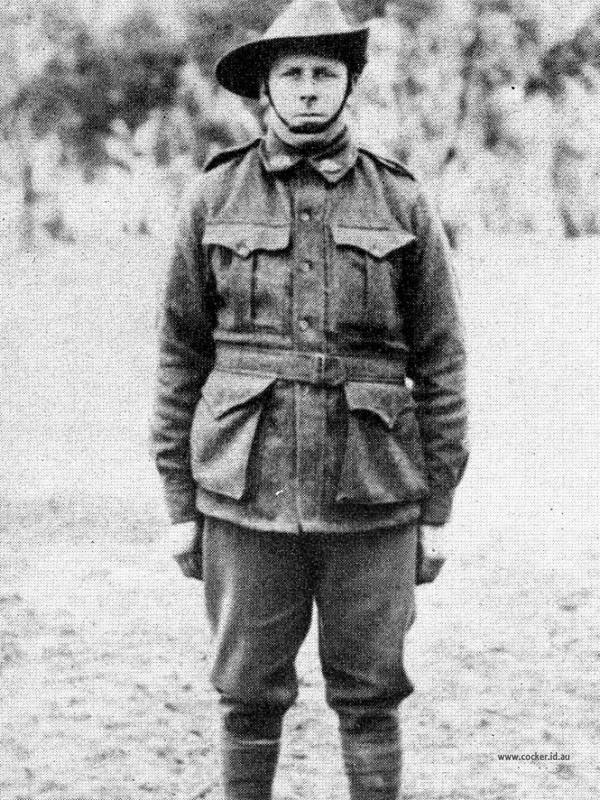 3-Francis Michael Goss was born on 4 Nov 1883 in Westbury, Tasmania, died on 22 Jun 1953 in Ulverstone, Tasmania at age 69, and was buried on 22 Jun 1953 in General Cemetery, Ulverstone, Tasmania. Another name for Francis was Frank. He served in the First World War. Frank became a drover, on one occasion moving 300 cattle and 17 horses from Cooee to Claremont, with assistance from his father Samuel ("Old Sam"), a nephew Victor, and one Frank O'Donnell. They were 11 days on the road. It has been stated that Frank had a problem because he couldn't whistle, and hence was forced to buy a whistle in order to work his dogs. Many drovers habitually used a metal whistle anyway, because in those days of unsealed roads and choking dust, lips soon became too cracked and swollen to whistle without artificial help. Some drovers, including Norman Walker, preferred to make their own whistles from the flat, round, inner metal lid of a tobacco tin by bending it to approximately the shape of a hairpin and boring or punching a hole in one side. The operator placed the curved edge against his mouth, and the blast produced was fairly indescribable. 4-Alexander Samuel Goss was born on 29 Oct 1918 in Barrington, Tasmania and died on 17 Oct 1972 at age 53. He served in World war 2. Alexander married Irene Joyce Rowlands, daughter of William Rowlands and Olive Alma Agnes Mather. Irene was born on 16 Jun 1918 in Ulverstone, Tasmania. They had two children: Garry William and Gail Anne. 5-Garry William Goss was born on 11 Aug 1948. Garry married Lynette Faye Von Bibra. Lynette was born on 21 Feb 1959. They had one daughter: Kristie Marie. 6-Kristie Marie Goss was born on 6 May 1975. 5-Gail Anne Goss was born on 12 Apr 1951. Gail married Dallas Howe. Dallas was born on 17 Jan 1938. They had two children: Leanne and Karen. 6-Leanne Howe was born on 27 Jul 1969. 6-Karen Howe was born on 25 Jul 1975.